Harold and Misa Hoshino, in what is believed to be their wedding photo at the Gila River War Relocation Center. We’ll never know Harold “Homecide Hal” Hoshino’s full potential as a boxer since one of his last fights, scheduled for Dec. 16, 1941 at the Olympic Auditorium in Los Angeles, was canceled due to fear of backlash following Pearl Harbor. Consequently, his boxing career was put on hold. My Grandpa Harold soon returned to his family’s farm in Pendleton, Oregon, which was located east of the exclusionary zone that Executive Order 9066 created. Although Harold was not incarcerated, he was affected since he began courting Misa Kondo of Pasadena before the war. On several occasions, he visited Misa and her family at Gila River. What sorts of emotions swirled through Harold’s mind when he was able to cross the barbed-wire enclosure and return to freedom, leaving his sweetheart and others just like himself behind? What was it like to live in mainstream America and face propaganda or hostile reactions as a result of looking like “the enemy?” How difficult was it for Harold to accept that his dreams would be put on hold indefinitely? Unfortunately, I was too young to ask my grandfather these questions before he passed away in 1998. 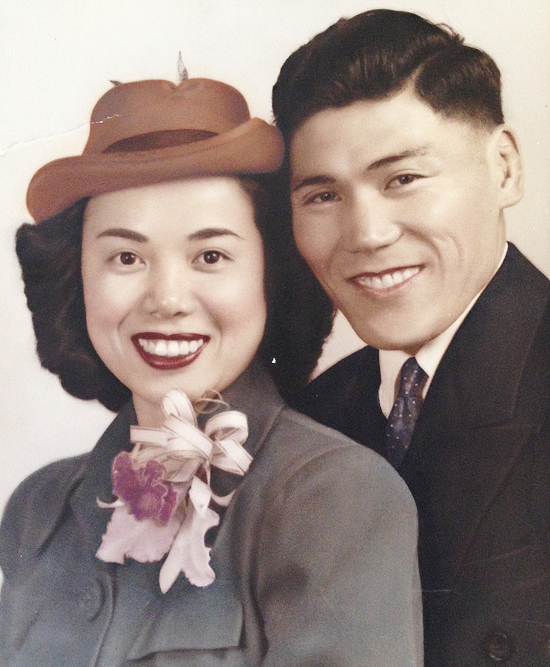 Without a doubt, the stories that my Nisei grandparents told (in addition to what I gleaned through their silence) shaped my understanding of the Japanese American experience prior to, during, and after World War II. None of them spoke with an inordinate amount of bitterness regarding the disruption to their lives, forced removal from the West Coast, material losses or wartime incarceration. My grandfather never expressed resentment towards the premature end to his professional boxing career. Instead, he discreetly kept his passion alive by continuing to jump rope and shadow-box in a corner of the garage into the later years of his life. When my Grandma Misa recounted her experience during WWII, she focused on the lighthearted moments and remained silent on the somber and painful, which is telling of the way she intended to define that chapter of her life. Although she mentioned the discrimination that she and my grandfather encountered in the postwar period when they were denied the right to purchase a home in Arcadia, she had a way of telling stories with the sense that looking forward was far more agreeable than dwelling on the past. Finding meaning through the silences or tempered recollections is important, though. The reticence of returnees to talk openly about the challenges that characterized the early years of resettlement has shaped the way that we have understood (or misunderstood) the effects of wartime incarceration as well as the postwar readjustment of Japanese Americans. As a historian, this has partly become the impetus for my research into the return and resettlement of Japanese Americans to Los Angeles. It’s important for us to acknowledge that the deleterious impacts of EO 9066 did not summarily end with the closure of the concentration camps, but rather continued throughout the postwar period and beyond. Kristen Hayashi is a Ph.D student at UC Riverside. My Stories E.O. 9066 is a series of stories on the continuing impact of Executive Order 9066 on the lives of Japanese Americans.